The materials that will be used in your outdoor furniture will play a key component to the functionality, aesthetic and longevity of your outdoor furniture investment. Outdoor living layouts should be considered in determining the true amount of exposure to sun, wind, rain and temperature variances furniture must withstand. Most high-quality outdoor furniture is designed to withstand the elements of nature; thus, you should expect years of use from your patio furniture. Rocky Mountain Patio Furniture would like to provide an overview of the most commonly used materials in patio furnishing construction. We consider assisting you in identifying the most appropriate furniture materials for your outdoor oasis an integral part our customer service commitment. This is to serve as a general overview, please contact our product specialists for additional information. Aluminum is in general a highly durable material. 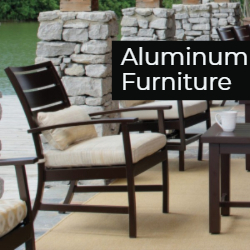 Aluminum naturally absorbs heat, so it is recommended to choose pieces that offer cushion seating and are finished in an UV-resistant, rust resistant powder coating. While it doesn’t rust, it will eventually oxidize and salt water environments will “speed” the oxidization. There are two primary types of aluminum construction and it is important to understand the difference between the two. Extruded aluminum is hollow aluminum that has been pushed through a machine that folds it into a tubular or square shape. Cast aluminum is solid aluminum construction. 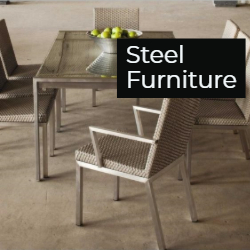 Steel furniture tends to be heavier than aluminum furniture however lighter than iron. Steel conducts heat so it is recommended to choose pieces that offer cushion seating. There are two primary types of steel furniture construction, which is very important to know if you are furnishing near a seaside or salt water area. Both types should be treated with a powder coating to increase lifespan. Wrought iron is made up of iron and a mix of cast iron or steel. 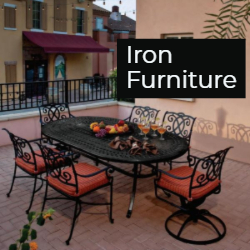 Wrought iron patio furniture is able to withstand extreme weather conditions and is incomparable to wicker or plastic furniture which tend to fade when exposed to harsh climatic conditions. Wood is the most common material for quality outdoor furniture. 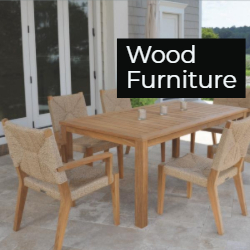 Wood materials often used in outdoor furnishings includes teak, bamboo, oak, cedar, acacia and eucalyptus. Teak is the most hardy of the woods and if well cared for, able to last a lifetime. 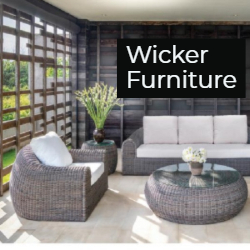 The term “wicker” refers to the woven style in which the furniture is made, not the material used. Resin wicker is typically made with thin strands of PVC, nylon, polyethylene, or high-density polyethylene. It looks similar to natural wicker but is much easier to care for. It is naturally water-resistant, so it will not develop mold or mildew. Benefits: Wicker resin resistant to rain, it can withstand humidity, hail storms, extreme cold, and intense heat. Other materials, such as aluminum are not able to withstand every type of damaging weather. It is an affordable, high quality option. 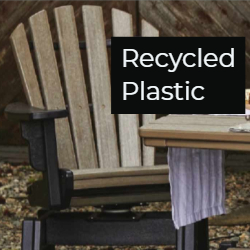 Recycled plastic (also called poly lumber) is made from recycled milk jugs that are converted into recycled plastic lumber. It is extremely strong and durable. And best of all, most recycled plastic is made to resemble wood but requires none of the care wood does. To explore patio furnishing options, visit Rocky Mountain Patio Furniture where you can browse collections or connect with a product specialist.